Saracens beat Glasgow Warriors 13-3 at Scotstoun to open their European campaign with a victory. An early try from Michael Rhodes, as well as eight points from the boot of England international Owen Farrell, cancelled out Adam Hastings’ penalty. It was an opportunity for young Scottish fly-half Hastings to test himself against one of the best – his opposite number, Owen Farrell – but he didn’t begin his European baptism with the impressive aplomb which has seen him set the Guinness Pro 14 alight in recent weeks. Farrell wouldn’t have missed an early penalty from in front of the posts, nor would he have thrown the ball aimlessly forward only minutes later, like Hastings did. In a game where Glasgow needed their young fly-half to withdraw his attacking flair and control proceedings, he could do no such thing. After Hastings spurned the opportunity to give Glasgow the lead, Saracens opened the scoring with a well-worked try from Michael Rhodes. After breaking into the 22 down the right touchline off the line-out, Saracens went through the phases, eventually finding space in the left corner for Rhodes to score. Saracens were uncharacteristically struggling at the scrum, and as Mako Vunipola left the fray with a knee injury, Mark McCall could have been forgiven for longing for the technical prowess and set-piece ability of Petrus du Plessis, who left Allianz Park two seasons ago. As it happened, du Plessis would make his debut for Glasgow later on after joining from London Irish on Tuesday. Though Hastings would put Glasgow on the scoreboard midway through the opening stanza, Farrell was consistently chipping away, increasing Saracens lead. 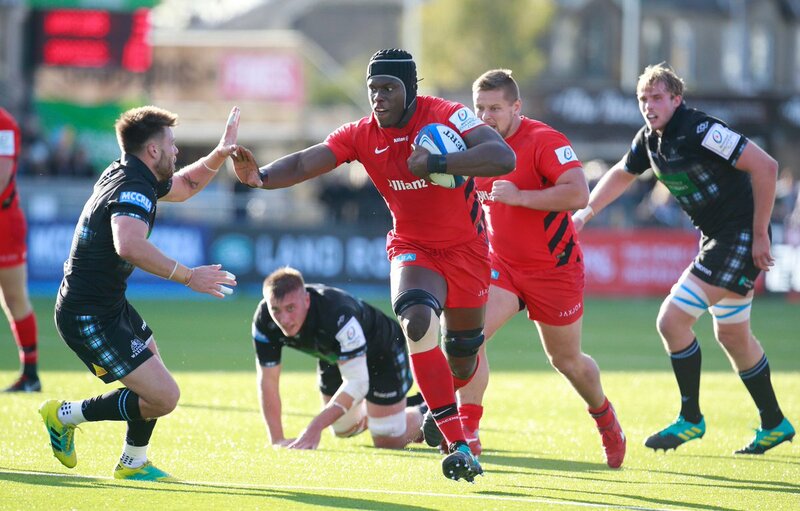 Nevertheless, Saracens’ predictably rock-solid defence was tested in a pulsating passage on the stroke of half-time, where Glasgow probed the line forcefully, only to be stopped by the whistle of referee Mathieu Raynal. It took a powerful tackle from George Kruis to stop Glasgow from scoring to set up a tense final ten minutes, but in truth, Saracens were rarely troubled and left Scotstoun with four points. Having competed so admirably, Glasgow can rue their misfortune in ending the game without even a losing bonus point for their efforts, but such is the clinical nature of the Saracens beast that they barely had an opportunity in the second-half. With Cardiff Blues snatching a shock win in Lyon, Glasgow’s inability to collect anything from this game looks all the more harmful for their qualification hopes and makes next week’s clash in the Welsh capital pivotal for the Scottish side. Saracens’ pragmatic approach was a return to their performances of yesteryear and was a far cry from the free-flowing, try scoring approach that they have applied so successfully in the Gallagher Premiership so far this season. With the visit of Lyon next week, Mark McCall’s side can reasonably expect that they will return to domestic action unbeaten in the European top tier.